We've built this motorhome for comfort and living. The roads in Australia are generally quite spacious and free camps are readily available so having a bigger RV set up to be self sufficient seems like a good way to go. It can be said that in Australia having a lifestyle that involves an RV (Caravan, Camper trailer, motorhome) is very common. Mostly recreational vehicle owners do seem to have caravans (usually behind a comfortable newish 4 wheel drive), and although they might do a bit in their earlier years, long term travel in an RV is mostly done by retirees, who we affectionately call "grey nomads" (amongst many other names). It's said* that there are over half a million registered RV's in Australia, not insignificant in a country with a population of about 24 million. Australia is the 6th largest country in the world (behind Russia, Canada, USA, China, Brazil) and so there is plenty of reasons to take your time seeing the great southern land. 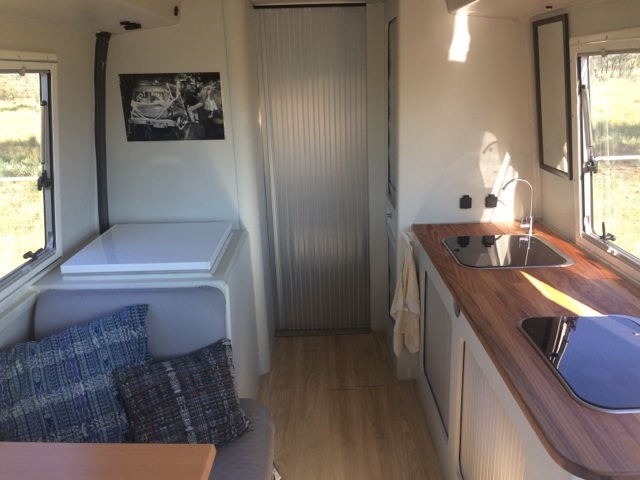 To make this motorhome as comfortable as possible, H first selected a bus that had 2 metres of headroom and a fibreglass outer to work with. He then stripped it down and replaced the non opening bus windows with walls and RV windows. We've put as many solar panels as we could fit onto the roof: that's 13 of 100 amp flexible panels. We've fully insulated it (really insulated it, I'm still surprised how cool it is inside while parked in the sun), put rotating chairs in and a bench seat, built and installed an eutectic fridge/freezer, installed a big 600amp lithium battery to suit those solar panels, and installed a washing machine. Even our mattress is a comfy 203cm tall by 145cm wide! This mobile home is built to live in. It's our home and so we aren't paying expenses on another home base at the same time. Considered this way, it's worth putting the extra touches into making it a nice place to live in. Our motorhome interior: Kitchen, dining, and the large chest in the left corner is the fridge. Note, we also have a door to the bedroom-bathroom. 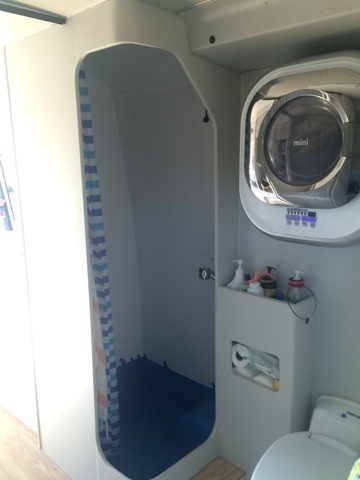 Shower, toilet and laundry in our RV/ Motorhome. 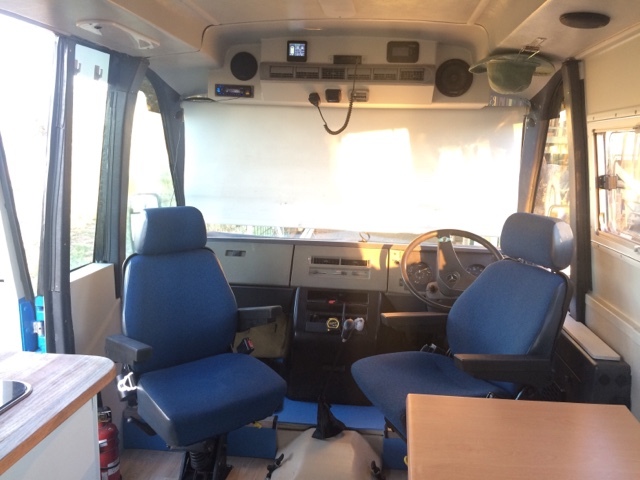 The front of the Motorhome bus: rotating chairs. I love your Aussie bus conversions! Here in the states we don't have the smaller medium sized buses. The more I looked into bringing one from Aus to the USA..the less i've found out. From what I understand the emissions controls and crash safeties don't match. I've fallen in love with the Toyota 4x4 coach buses! Thanks Bill. We think the Toyota is a great choice, but H is very tall and they don't have enough head height for him. I don't know anything about getting them into the USA, but I know a company called 'Bus 4x4' does some nice looking conversions on them. Or, maybe you could get one of the Toyota buses from Japan. Of course the steering wheel will be on the right hand side.